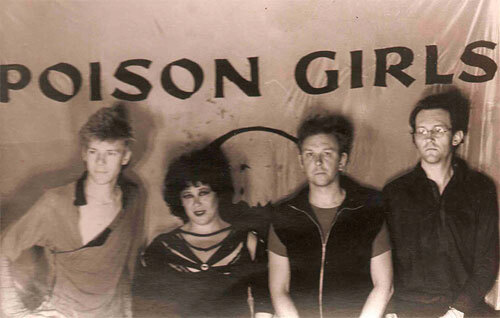 1979 - January 1979 saw the start of the partnership between Poison Girls and Crass. Over the next 2 years they were to play 97 gigs together, and Poison Girls played a further 50 odd by themselves. All but a handful were benefit gigs. All were outside commercial music business venues. This activity jump started the anarcho-punk movement as we know it today. Played various tours around Britain, Holland. The height of the British Movement/National Front activity at punk gigs. Poison Girls gigs regularly targeted, most notably the Conway Hall in Holborn, and the Theatre Royal in the east end, and on one occasion at their home, Burleigh house. First serious attention from the music press, Sounds article by Phil Sutcliffe, NME by Graham Locke November 1979. Burleigh House eventually demolished December 1980 and the band relocates to Leytonstone in East London. 1981 - First tour in what was West Germany, and through the corridor to Berlin (still a landlocked western enclave behind the ‘iron curtain’). Getting increasingly frustrated playing to only male punk crowds. Nil takes over the bass, and the band tour England, Wales and gigs in Dublin and Belfast as part of the ‘Total Exposure Tour’.